Opinions are starting to split badly on the market and the economy. Main Street has become more upbeat on the economic outlook. 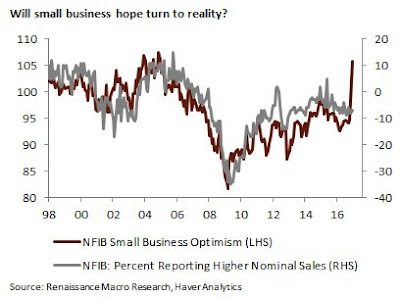 The NFIB small business survey showed that optimism surged in December, though Renaissance Macro pointed out that optimism has not translated yet into a significant upswing in sales growth. The post-election surge in optimism was accompanied by an unprecedented degree of both positive and negative concerns about the incoming administration spontaneously mentioned when asked about economic news. The importance of government policies and partisanship has sharply risen over the past half century. From 1960 to 2000, the combined average of positive and negative references to government policies was just 6%; during the past six years, this proportion averaged 20%, and rose to new peaks in early January, with positive and negative references totaling 44%. By contrast, I am seeing signs of doubt from political circles that Trump will be successful with his pro-growth agenda, even among Republicans. Traditional approaches to sentiment analysis states that the public tends to be slow. When the public finally latches onto an economic theme, it is indicative of a contrarian top (or bottom). On the other hand, the improvement in business and consumer confidence can be signals of broad based economic strength. So who is right? Main Street, or Washington? Here is what's at stake for equity investors. 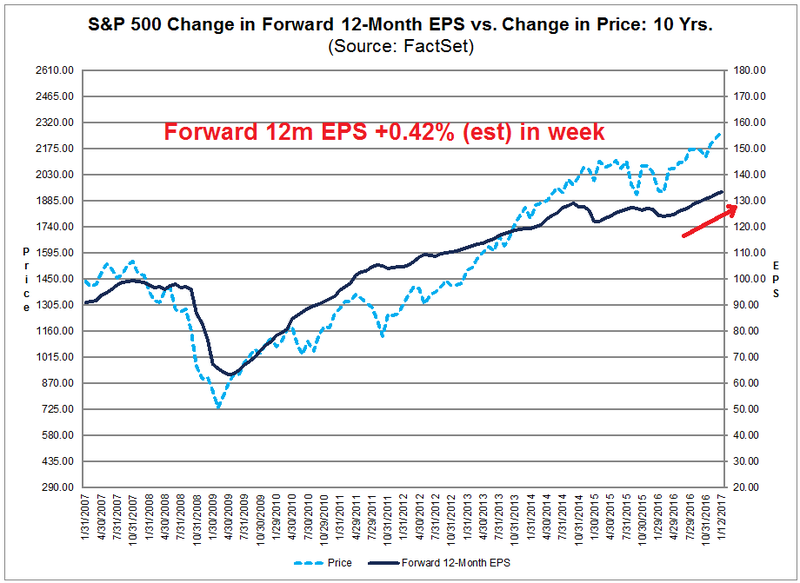 As we enter earnings season, Factset shows that forward EPS continues to rise, which is indicative of Street expectations of broad based cyclical strength. However, broad based cyclical upturn can only get you so far. This Factset chart also shows that forward P/E ratio is elevated and expensive compared to its own history. 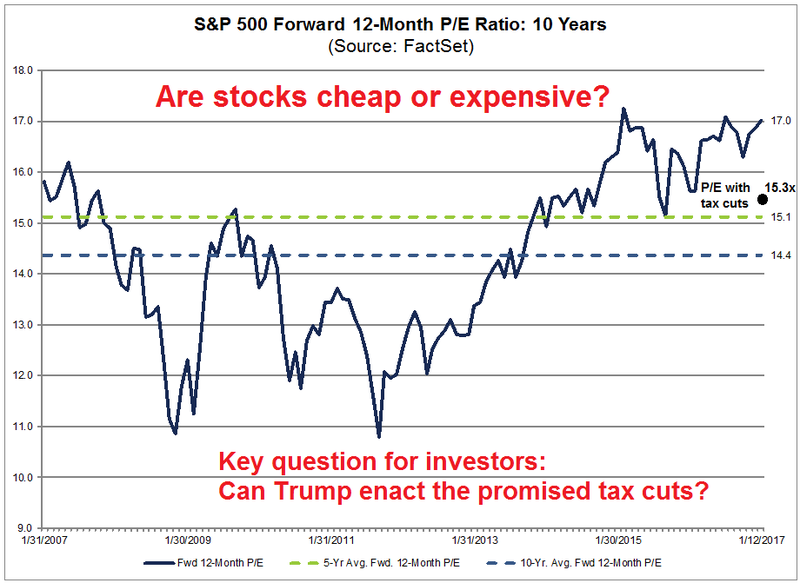 Current forward P/E is based on bottom-up derived earnings based only analyst expectations of economic conditions without the Trump fiscal plan. That's because you can't make estimates when you don't have the details of the proposals. 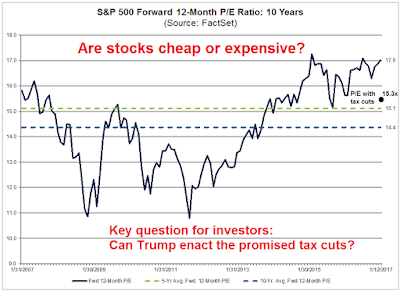 A top-down analysis suggests that the Trump tax cuts could add roughly 10% to forward earnings, which would bring down the forward P/E ratio to more reasonable levels (annotations are mine). To rephrase my previous question: Who is right about the expectations for the Trump tax cuts? Main Street or Washington? 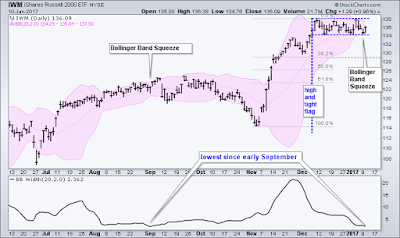 Mid-week market comment: Arthur Hill at stockcharts recently observed that the Russell 2000 was in a tight consolidation range, which is characterized by a narrowing Bollinger Band. 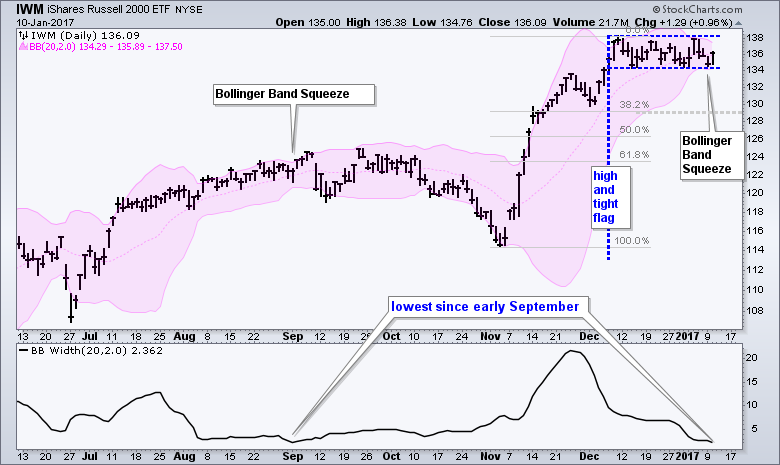 Such conditions tend to resolve themselves with volatility expansions which represent breakouts from the trading range. His remarks about the Russell 2000 could also be applicable to the current conditions of the SPX as well. The key question is which direction will the breakout occur? I had been meaning to write about the December Jobs Report, which was released last Friday, but I hadn't gotten around to it. The report had elements of both good news and bad news. The good news is the December report showed a solid market. 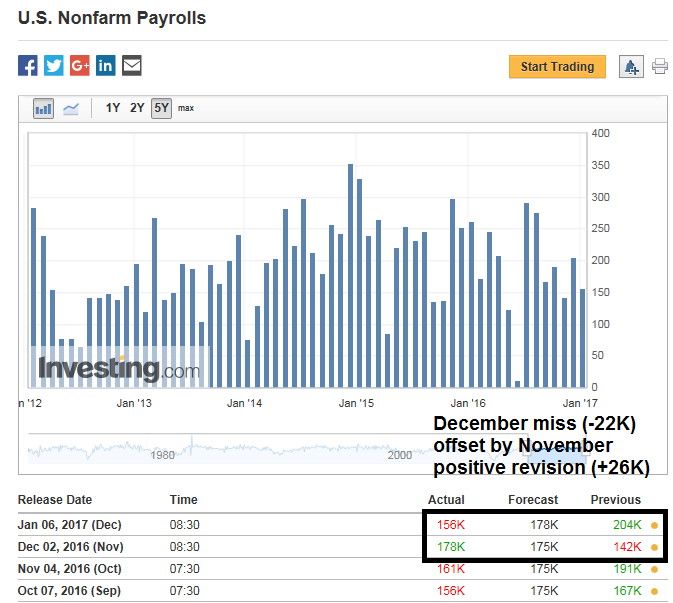 True, the headline Non-Farm Payroll figure missed market expectations, but November was revised upwards, and the positive revision in November was bigger than the December miss. 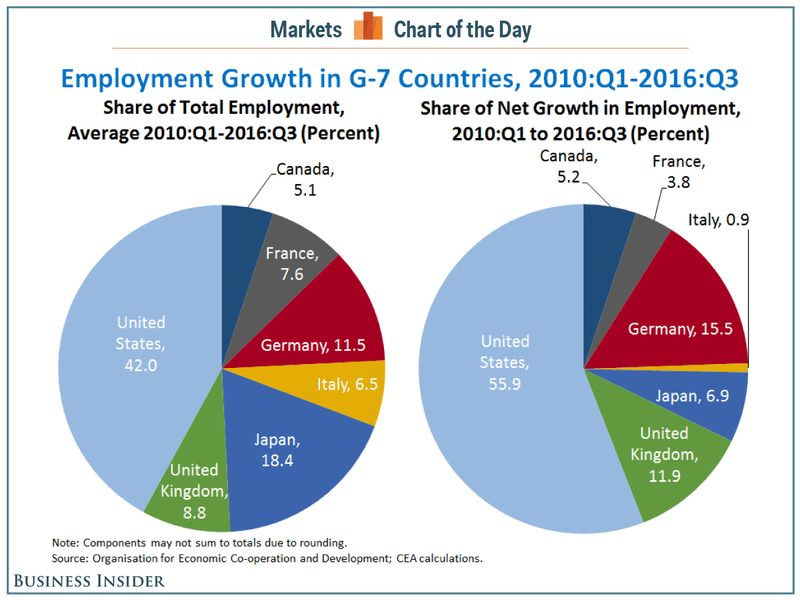 In conjunction with the December Jobs Report, the Council of Economic Advisers released a report indicating that the American economy had added more jobs than other advanced economies in the last eight years (via Business Insider). 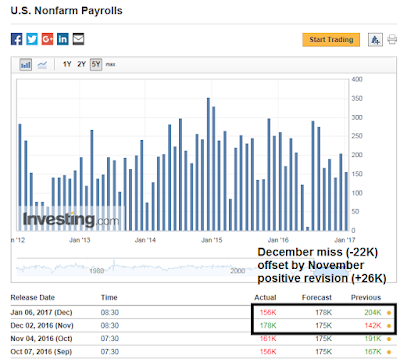 Notwithstanding the political victory lap nature of the CEA`s report, the December Jobs Report should keep the Fed on track with its expectations of three rate hikes in 2017. Here is the bad news. There are worrisome signs that the economy is starting to overheat. The combination of Fed actions on interest rates and wage pressures on operating margins are likely to be unfriendly to the stock market. Unless the Trump administration comes through on their promised tax cuts in the near future, upside for equity prices will be limited in 2017. At the end of 2016, WSJ reporter Greg Zuckerman made a tweet with ominous implications. Hmm...what happened in 1929? Here is how a market crash can happen. Donald Trump's appointment of Peter Navarro, the author of Death by China, represents the biggest source of policy tail-risk for the capital markets. Bashing China may be satisfying for Trump supporters, but the Chinese economy is increasingly fragile (see How much 'runway' does China have left?). Impose tariffs on Chinese goods, and you risk a Chinese economic slowdown that drags the world into a synchronized global recession. While a crash is most definitely not my base case, the scenario of collapsing trade flows from a Chinese hard landing would first tank the Asian economies, followed by Europe, whose banking system are still over-levered and have not fully recovered from the Great Financial Crisis. Under such circumstances, an equity bear market would be a 100% certainty, and a market crash would be within the realm of possibility. It's hard to estimate the actual probability of a US induced China hard landing scenario. However, we should get better clarity as the Trump team moves into the West Wing of the White House in the coming weeks. In addition, President-Elect Trump may give us some clues on trade when he holds his press conference on Wednesday. Top-down meets bottom-up: How expensive are stocks? Recently, I have seen several variations of market analysis concluding that stocks are expensive based on forward P/E ratios. Here is a tweet from Jeroen Blokland. David Rosenberg characterized the current equity environment as picking up pennies in front of a steamroller. Blokland followed up the above tweet with an additional comment indicating that earnings growth is badly needed. Does this mean it's time to get cautious and sell your all stocks? Not so fast! 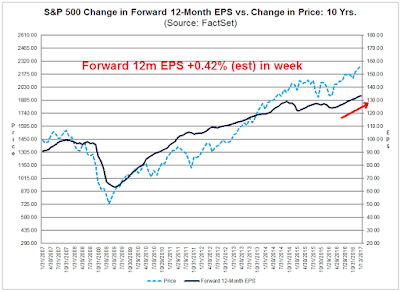 A case can be made that the analysis of the forward P/E chart is based on a misread of how forward EPS expectations are formed. On an adjusted basis, stocks do not appear to be expensive at all. As 2016 has drawn to a close, it's time to review the report card from my 2016 calls. My inner investor performed very well, though my inner trader suffered a number of hiccups. Overall, I had a solid year in 2016. The chart below depicts the key highlights of my investment calls, which are based on a 6-24 month time horizon. I remained steadfastly bullish for most of 2016 even as others panicked. The jury is still out on my latest call for a correction in early 2017 (see A correction on the horizon?). My analysis has turned out to be largely correct. The chart below depicts the calls of my trading model. While they appeared to be very good at first glance, I discovered a couple of problems in implementing the trades. First, the model was a little slow and did not react to the slow deterioration in the market during the late summer. Even as the model remained long, the slow drip-drip-drip downtrend in prices (marked by the white arrow in the chart) was a little disconcerting. As the trading model is based on sensing changes in price trends, the lack of trade signals highlights a problem when the market moves sideways. On the other hand, another problem arose when the model became overly sensitized to changes in prices. The trading model experienced whipsawing signals in the aftermath of the Brexit election (buy to sell to buy within a few days) and the US election (buy to sell to buy in the overnight futures market). These two issue highlight the need for further research in the future. These problems highlight the problem with short-term trading and trading models. The chart above is a weekly chart and therefore does not show the actual price volatility experienced by traders. Sometimes trading is like that. You think you have the perfect setup, followed by the perfect signal, then you miss on your execution, which results in an unfortunate outcome (click this link if the video is not visible). I have no idea of what 2017 will bring, though I outlined my market views in my last post (see The cloudy side of Trump). In all likelihood, the incoming Trump administration will create a high degree of uncertainty and market volatility. I hope that I can help you navigate it in the year to come. Is the Trump honeymoon over? Bloomberg had a marvelous article that captures the market's mood right now. 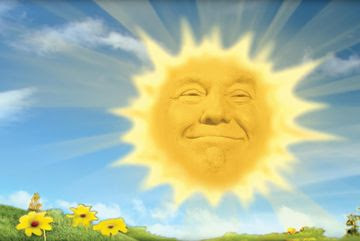 It is entitled "The sunny side of Trump:There’s reason for short-term optimism. Then he has to deal with his policy contradictions". How long will this honeymoon last? For American business, the positive scenario is that Trump appoints sensible people, matures in office, and puts most of his considerable energy into the pro-growth parts of his agenda. The negative scenario is that he goes back to being the inciter who flew off the Twitter handle so much during the campaign that his people temporarily seized control of his account. The bull case, which I laid out two weeks ago (see How Trumponomics can push the SP 500 to 2500+), is well known. Since the election, the stock market has embraced the prospect of a global cyclical upturn, anticipated fiscal stimulus, and buyback gains from a tax holiday fueled repatriation of offshore corporate cash. I went on to outline the bear case as the second part of my series the following week (see The bear case: How Trumponomics keeps me awake at night). As Inauguration Day approaches, acts such as the appointment of Peter "Death by China" Navarro as trade czar has begun to unnerve the bulls. Market psychology is starting to turn from greed to fear. Concerns are rising that new Trump edicts may see parallels to this scene from Woody Allen`s 1971 comedy, Bananas (click this link if the video is not visible). To be sure, bullish sentiment has surged in the short-term. Stock prices may have run ahead of themselves and a corrective period is likely. The bigger question is how will the bull and bear case resolve themselves in the longer term? I address that question this week with a scenario analysis that has some surprising results. A correction on the horizon? Mid-week market update: It's always nice to take a few days off during the holidays, except all that I got for Christmas was a cold. The stock market doesn't seem to be doing too much better as it tests the bottom of a narrow trading range during what should be a period of positive seasonality. 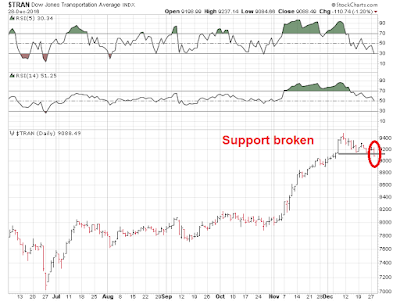 None of the other major indices, such as the DJIA, NASDAQ, or Russell 2000, have broken support. 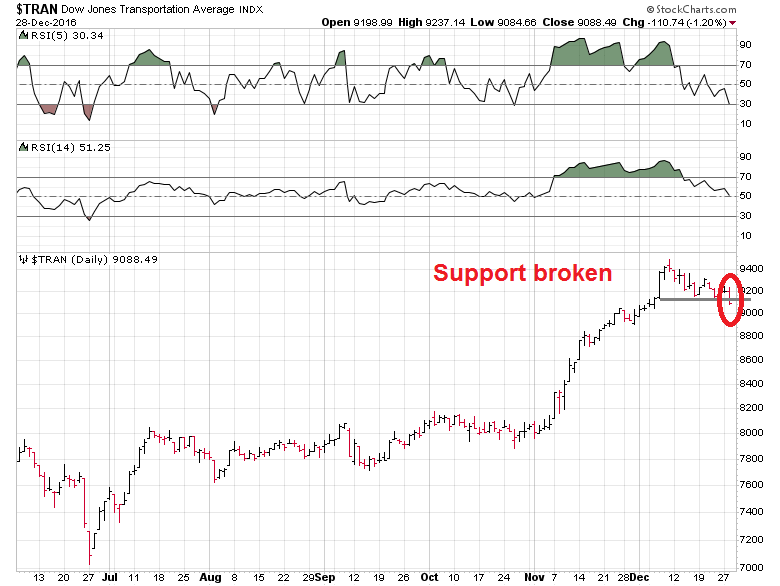 The one exception is the Dow Jones Transports. My inner trader has a number of tactical concerns as we look ahead into January. In last week's post (see How Trumponomics could push the SPX to 2500 and beyond), I laid out the bull case for stocks under a Trump administration and how stock prices could appreciate 20% in 2017, assuming everything goes right. This week, I outline the bear case, or how Trumponomics keeps me awake at night. In this post, I will discuss each of these points, and I will end on how I believe these contradictions are likely to be resolved by the market. 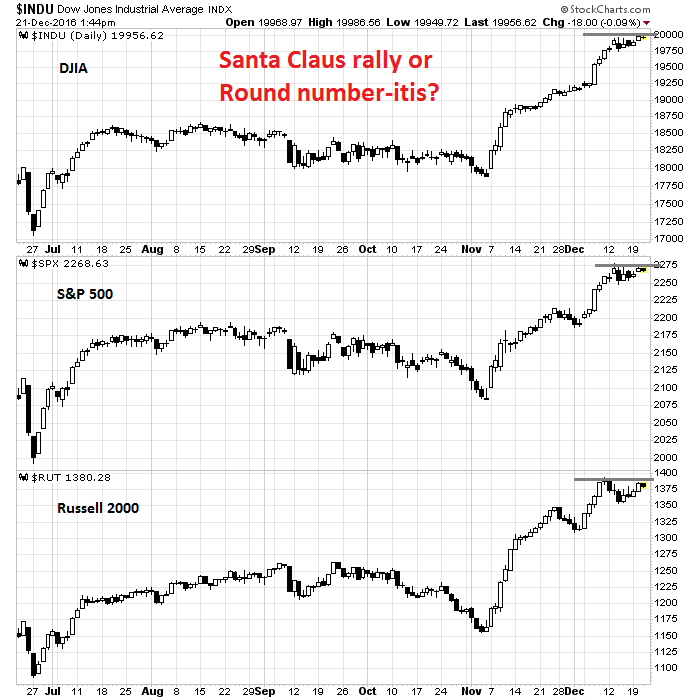 Santa Claus rally, or round number-itis? 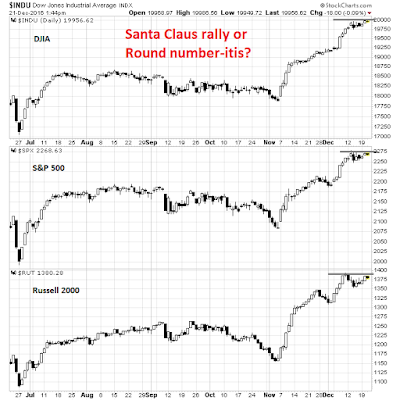 Mid-week market update: As the Dow approaches the magic 20,000 mark, the question for traders is: Will Santa Claus be coming to town this year, or will the market advance stall as it catches "round number-itis"? Here is what I am watching.